Benchmarking the Marketing Function: What's in it for YOU. (Note: this post was co-authored by Laura Patterson, President of VisionEdge Marketing, and Jerry Rackley, Demand Metric Chief Analyst) Long-term readers and followers of VisionEdge Marketing know that Laura’s husband is in construction. He completed an extensive apprenticeship early in his career, and as a contractor he is required to have a license. To keep his license, he must complete a minimum number of continuing education (CE) credits. This scenario is common in other professions as well. For example, US medical doctors and CPAs are typically required to complete some number of practical hours, pass an exam to secure their license to practice, and then stay abreast of their field with CEs each year. Marketing, however, is different. Coming from various backgrounds and levels of education, our apprenticeships are typically “learn by the seat of our pants.” Some marketing professionals work hard at staying current on best practices, new technologies and techniques, and expanding their skills through various forms of education, such as articles, books, online programs and in-person educational venues. Other marketers can’t seem to squeeze out the time given their work load. Even so, for the sake of our discipline, our professional careers, and the firms who employ us, we all want to identify areas where we can improve. Benchmarking serves as a valuable way to discover best practices and compare your performance to them. Benchmark information helps you identify process gaps that when addressed can lead to a competitive advantage. There are only a few opportunities to do structured benchmarking of your marketing capabilities. VisionEdge Marketing and partners, has been conducting the annual marketing performance management (MPM) study since 2001. The Content Marketing Institute has conducted a B2B benchmarking study for the past six years. Silverpop, now part of IBM, has conducted an annual email benchmarking study. Christine Moorman, Director of The CMO Survey, and a senior member of the Marketing Area at The Fuqua School of Business and the T. Austin Finch, Sr. Professor of Business Administration, has conducted an annual benchmarking study since 2008. Your participation in studies such as these helps identify and analyze world-class performance. If you are committed to the marketing discipline please participate in these studies to identify and incorporate best practices. 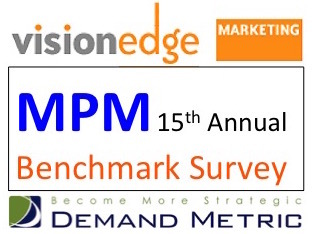 The 15th annual MPM study being conducted by Demand Metric and VisionEdge Marketing is now in the field. Participating in the study will take time – approximately 20 minutes. But as marketers grapple with accountability, data, analytics, and process, this study provides insights into what best-in-class marketers do better and differently. In exchange for your participation, you will receive a copy of the results enabling you to identify areas for improvement and the size of any gaps, so you can prioritize your investments for enhancing your skills, processes and capabilities. For those of you who didn’t participate in last year’s study, you may find 2015 Marketing Performance Measurement Study Abbreviated Summary: A Diagnosis and Prescription for Marketing Performance Measurement useful. Thank you in advance for helping the marketing discipline!